Quilters of all skill levels realise the importance of having the right tools for the task at hand and will spend time to learn how to be fluent in their use. Regardless of the type of quilt you want to make, elementary tools such as needles, hoops and pins are an essential aid for all hand quilters. Familiarity with some of the other tools and knowledge of how to use them can drastically reduce the time it takes to make your quilts. Quilting machines are one obvious example of this, but other tools such as rotary cutters can also be a real time-saver! It is very important to make sure you mark your quilt fabric with a medium that will wash out or fade away. Here we discuss the different types of fabric markers available and which one is best for your quilt. Long armed quilting machines are every machine quilters dream come true! They have a very long arm that makes it very easy to quilt large projects as with these machines you are not having to hold the weight of the quilt all the time which is often heavy and very clumsy. The needle is the most important part of a sewing machine. Choosing the right type of quilting needle will make quilting a little easier, prevent puckering, bumping and even breakage. Read on to find our more about the over all effect the quilting needle can have on your quilt! Find out which pins are best used for quilting and how pin cushions and magnetic pin strips can make your quilting experience a lot more fun. Discover the variety and usages of thimbles and why you should always use one. Learn how to choose which quilting frame or quilting hoop is the best one for you. Step-by-step instructions on how to use a quilting hoop and why it is so important that every quilter has one. Quilting machines are not what they used to be. Gone are the days where you had two stitch options and the inconvenience of pushing through the quilt sandwich. Read on to find out how much quilting machines have advanced. Choosing the right type of needle can have the biggest impact on how much you enjoy making your quilt. Find our which types of needle you might need for quilting and the overall effect they can have on your quilt. It is really important to choose the right types of thread for your quilt as the colour, composition and type can have a huge difference to the finished quilt. Cutting your fabric is a vital step in the quilting process. It is very important each piece is perfectly aligned in order to prevent an uneven or sloppy appearance. A rotary cutter offers even the shakiest of hands the ability to produce perfect even slices every time! Choosing the right type of template will have a big effect on your quilt. 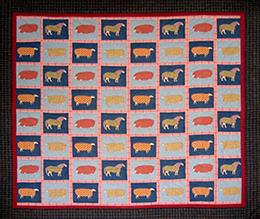 There are a number of mediums that can be used and depending on the usage, size and style they will give your quilt a varied look. Templates can be considered the basis of the structure of your quilt and when use properly can help quilters produce a fantastic and desirable heirloom.